Although their campaign has concluded, if you would still like to make a donation to support Panther Swim Club, you may always do so here. Help 26 dedicated swimmers on our journey to The Collegiate Club Swimming & Diving National Championships at Georgia Tech (April 6-8), for the third time in Panther Swim Club history! After a slightly hectic but very successful second trip to Nationals last year, we are excited to head back to the competition this year and do even better. All 26 of the swimmers competing have worked incredibly hard this year to make qualifying times to be able to attend this meet, and are continuing their hard work to swim their best in Atlanta this April. We’re asking for your help to alleviate travel and meet costs for the swimmers. 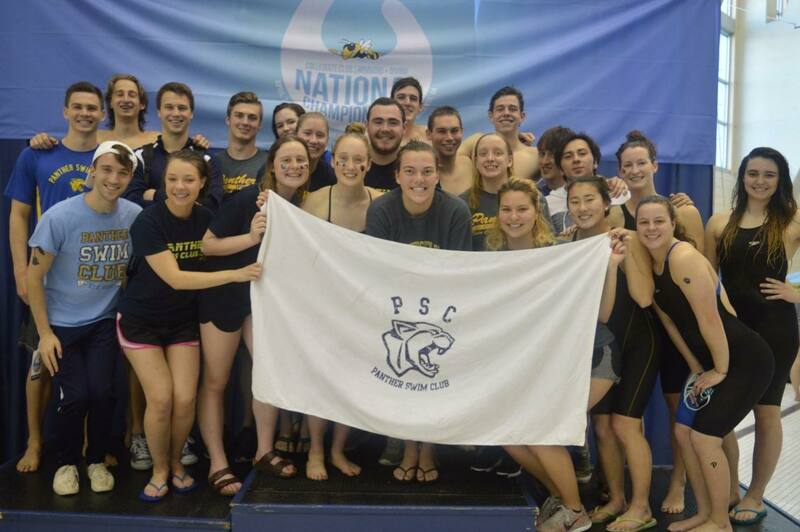 Panther Swim Club (PSC), founded in 2011, is an award-winning organization run by students at the University of Pittsburgh. PSC is currently made up of over 100 students with all levels of capabilities, from experienced swimmers that have been swimming their whole life, to swimmers who have never participated in competitive swimming before. Regardless of skill level, we have all become part of a team that feels more like a family, and we hope to continue this growth in seasons to come. The East Coast Collegiate Swim & Dive Club National Championships will be held on Friday, April 6th through Sunday, April 8th in Atlanta, Georgia at Georgia Tech. One hundred teams from across the country will travel to swim with over two thousand swimmers. Last year, multiple swimmers from PSC made it back to finals, which means they finished among the top 20 in the country. Our veteran president Andrew swam particularly well and placed 4th overall in the 50 breaststroke. The rest of the team swam wonderfully with many college career personal bests and even some life time personal bests. As we approach Nationals for the third time, we would like to have an even more successful meet with both veterans and rookies competing for our team. There are many ways you can help your favorite club team be successful at Nationals! These include, but are not limited to, donations, spreading the word, sharing our link, and cheering us on as we travel to Georgia Tech. 100% of the funds raised through this campaign will be used to pay for the many expense we will incur on our way to Nationals. These expenses include: meet registration fees, airfare and ground transportation costs, hotel costs, teamwear and airport parking. Any excess funds raised will be put towards our general season expenses. This donation will cover two relay team entries! PSC can’t get enough of relays and this donation goes to show that any amount means the world to us! Get there and back ASAP! After what may be a mad dash to the airport, this donation will pay the airport parking fees for one car! This race is a test of a swimmer's skills in all four strokes! This donation will also cover three PSC swimmer’s meet entries along with one relay entry. Now that’s versatility! You thought the 100 free was tough? Multiply that by five and see how you feel then. This donation will cover the meet entries of five PSC swimmers! This event tests both stroke skill and endurance. Help PSC rest up for our big competition by covering one hotel room for one night with this donation! Breast stroke skills. You either have them or you don’t. A beautiful and sleek stroke not perfected by many. This donation will help PSC look stylish as a whole by covering the cost of our official Nationals swim caps. This event sure takes guts. Completing a 400 IM takes lots of practice and commitment. This donation will significantly help us in the long haul by covering one swimmer's round trip from our beloved Pittsburgh to Atlanta along with one hotel room for the whole weekend! So. Many. Laps. This donation goes the ultimate distance by covering three round trip flights to Atlanta!